13802: War Star Grille Logo. This extreme high quality precision made universal grille logo will fit any custom mesh or billet style grille. Made from thick 12 gauge top quality T-304 stainless steel, it comes highly polished to a brilliant chrome shine. Measures approximately 7" diameter but can be special ordered to your size specs. Securely Installs with stainless threaded studs welded on backside. Can not be removed without opening hood. Backed by manufacturers lifetime warranty. Made in USA. (Please allow about 2 weeks in manufacturing before shipping). Truck enthusiasts from around the world trust and invest in Royalty Core™ products to improve and separate themselves from the competition. In 2008 Royalty Core sold a major division of their business that manufactured products for the motorcycle industry including mainstream motorcycle companies such as Harley Davidson and Honda. 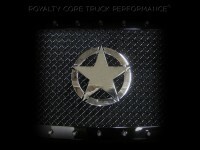 Now Royalty Core™ is known for their exclusive brand in the truck industry for all around superior products. They operate the industries top CNC machinery, powder coating, and tooling. Much of the work is done by hand with our gifted and experienced team of craftsmen. Each product is quality controlled multiple times to ensure the highest level of quality on the market. Royalty Core™ specializes in the finest materials such as T304 stainless steel and their products are built in-house right here in OR, USA. • Q: Other grille companies use plastic studs around their grille frame. A friends grille was cracking and peeling. Are your studs around your grille plastic? • A: No, we do not do use plastic. Our studs are 100% stainless steel and unique in character. • Q: Are your grilles really built out of stainless steel? • A: Royalty Core™ builds the worlds highest quality grille period, and stainless steel is corrosion resistant to outlast the rest. Every part of our grille is T304 stainless steel including the grille frame, mesh, studs, logos, and hardware. • Q: I don’t want to mention any names but why are your prices so reasonably priced compared to other companies with similar grilles? Your prices are only about half of some I’ve seen. • A: It’s not fair to our customers to mark up products that high. Our mission is to please customers with a better product without a price that kills your pocket book. Our passion is in our products, not in money. • Q: Are your grilles built in the USA? • A: Yes! In fact, right here in our facility from start to finish. We do our own machining and fabrication work providing you with the best truck grille in the industry. • Q: What about color matching grille frames? • A: We have a full mixing bank to make any OEM or factory colors. All we need is your paint code. We also do all powder coating in house. Tell your friends about the Universal Grille Logo - War Star Emblem. Share this product on Facebook, Twitter, MySpace or send an email to a friend!